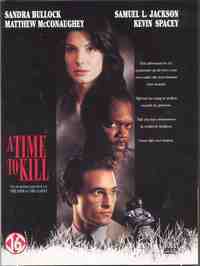 John Grisham's bestseller A Time To Kill hits the screen with incendiary force, directed by Joel Schumacher (Batman Forever, The Client). Sandra Bullock, Samuel L. Jackson, Matthew McConaughey and Kevin Spacey portray the prinicpals in a murder trial that brings a small Mississippi town's racial tensions to the flashpoint. Amid a frenzy of activist marches, Klan terror, media clamor and brutal riots, an unseasoned but idealistic young attorney mounts a stirring courtroom battle for justice.